First description appears in the Van Houtte catalogue, 1864-65 as ‘Contessa Lavinia Maggi Roi des Belges’. First exhibition was in Brussels in 1864. Flowers are as for ‘Contessa Lavinia Maggi’ except that most are red splashed with white. A few remain solid red. A further synonym has been ‘Contessa Lavinia Maggi Multicolor’. It was the third and last camellia dedicated to Prince Leopold of Saxe-Coburg and Gotha; Duke of Saxony, (16 December 1790 – 10 December 1865), who became on 21 July 1831 the first King of the Belgians. This followed Belgium’s independence from the Netherlands. He was the founder of the Belgian line of the House of Saxe-Coburg-Gotha, and uncle of Queen Victoria of the United Kingdom. C.j. ‘Roi Leopold’ by Defresne from Liège, Belgium in 1851. All three of these are still available in Belgium and France. 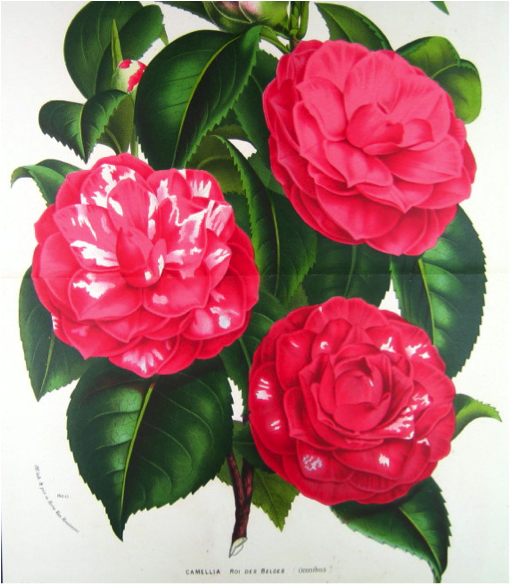 Location of long established plant; A plant from the 19th century is still present in the royal camellia collection at Laeken, Brussels.